Trustees are elected by the parent community and staff members. We are looking for FIVE parent elected trustees in this election. The Board meets twice a term (8 meetings a year), see our School calendar for dates. Meetings are open to the public, however, they are not public meetings where everyone has the right to speak. Speaking rights can be granted in advance by the Board Chair. In some instances, parts of Board meetings are closed to the public when the Board is discussing confidential matters. Nominations forms will be sent out to all parents/caregivers in the last week of the April school holidays by (Heidi Vosse - Returning Officer)l.
Nominations need to be handed in by noon Friday 24th May 2019. If more than 5 candidates are nominated, voting papers will be sent to all parents/caregivers on the school roll soon after this date. Voting will close at Noon on Friday 7th June 2019. Results counted by the returning officer by Thursday 13th June 2019. The new board takes office on Friday 14th June 2019. 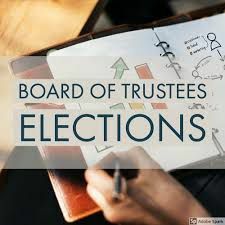 Attached is a community member guide to the role of the board of trustees. This explains a lot of commonly asked questions and information about becoming a trustee. If you would like a board member to contact you about any questions, please email heidivosse@gmail.com and I will send the information to the right person.